I have wanted to try making an exploding box for a long time and I have finally done it. It was so easy! I made this in one evening. I am giving this to my Grandma for her 80th birthday! 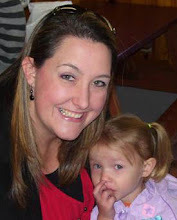 I was making it so she could put pictures of all of her Great Grandkids but now I am thinking that maybe I should just put random pictures of all of our family... So far there are only pictures of my 4 kids in it. I still have a couple of weeks to decide what pics I put in. I really like the way it turned out in such a short time! I am including the instructions on how I did it. I found a bunch of different directions on line but I ended up making mine a little different than the ones that I found but I think it still works. Thanks for stopping by! 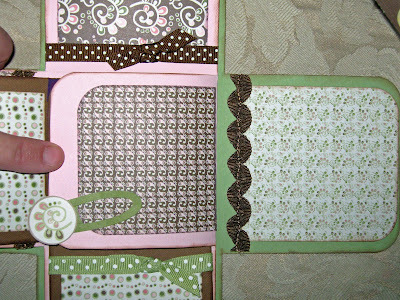 First sheet of cardstock 12x12 (outside of box), score cardstock at 4" on all 4 sides with the bone folder. 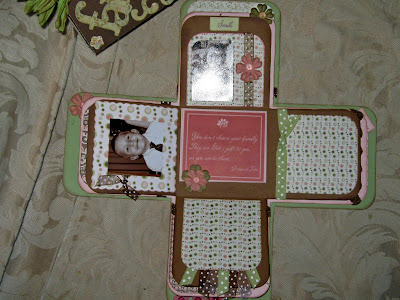 Cut out 4 corners so it looks like a cross then fold on all of the scored lines. Second sheet of cardstock, cut to 11x11, score at 3 3/4" on all 4 sides and again cut out 4 corners and fold. 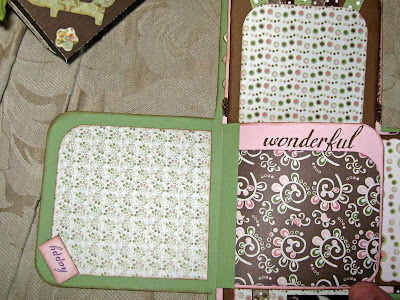 Third sheet of cardstock, cut to 10.5x10.5, score at 3 1/2" on all 4 sides and cut out 4 corners and fold. 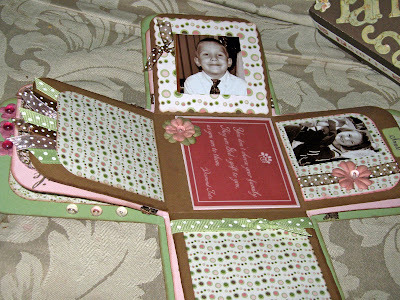 I then used 8 pieces of coordinating patterned paper to emblish both sides of all of the squares. There will be 24 squares. 20 of them can have pictures but the other 4 will be the outside of the box. I then added ribbon, flowers, rub-ons, skittles, etc. to embellish. Once the embellishments were done I used double sided tape to tape the layers together. Tape the center only. I started with the smallest and taped the center only to the middle sized paper. Then I taped those to the largest piece, again only in the center. Lid - Cut the 4th piece of cardstock to 8x8 and score at 2" on all 4 sides. Cut only one side of each corner square and glue together. I used paper clips to hold the edges together while the glue dried, but because I used Glossy Accents it dried in 10 seconds and has a very stong bond! 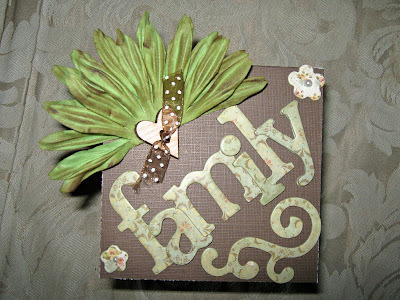 (I learned that trick from Tim Holtz!) Embellish the top of the box and you are done!!!! It really is easy and is super fun to take the lid off and have the pages flop out! ENJOY! Jenny, I love it. Thank you so much for posting the directions!! I have been wanting to do one of these for awhile. Absolutely gorgeous! This is beautiful. I LOVE the papers you used! Awesome job once again girl! And you do such a wonderful job passing on all the directions! Thank you for that! You're AWESOME! !